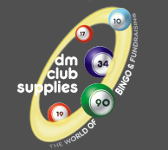 "Having used DM Club Supplies for my bingo and fundraising products over the last 6 years I would not go anywhere else"
"Great service, quality products, excellent delivery schedule"
"A1 service, friendly staff, competitive prices"
"Many thanks for such a superb service, now I know why I have trusted your business for so long"
"DM Club Supplies are very competitive on price and offer good quality products. They are always my first port of call!" © DM Club Supplies Ltd. 11 Station Rd, Mochdre, Colwyn Bay, Clwyd, LL28 5EF - Company No: 09198491.